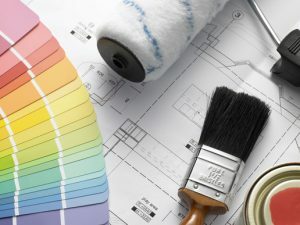 Octavio’s Painting, LLC, is home to licensed, bonded and insured painting contractors in Albuquerque, NM who have the equipment and expertise to handle every aspect of your residential or commercial painting project. You’ll rest easy knowing that our professional painters are handling your project, as we take the time to prepare the site before we begin any work, and clean up after ourselves after we complete our work. Contact us for a FREE quote! From simple touchups to new construction projects, our residential painting contractors have everything you need for beautiful, durable interior paint in your home. We begin by carefully masking your floors, fixtures and furniture before applying new, washable acrylic paint with spray and sponges. We can help you decide which colors and sheens are right for your home, and deliver with a vibrant, clean paint job that looks great for years to come. Our Albuquerque residential painting contractors also provide complete exterior painting services, including stucco repair. Make the right first impression on your clients and colleagues with neat, clean interior and exterior paint. Whether you need new paint inside our outside of your office, our Albuquerque painting contractors aim to complete your painting project with as little interruption to the day-to-day running of your business as possible. In addition to commercial painting, our contractors also repair and hang drywall. Want to see previous work from our Albuquerque painting contractors? Take a look at our gallery! We are full service drywall contractors in Albuquerque, NM. Whether in your home or commercial business, we can perform simple replacements, as well as hang drywall for new construction projects. From start to finish, you can trust our experienced drywall contractors to take care of every aspect of your drywall project, including interior and exterior paint. It’s not unusual stucco to crack and become worn over time. Repairing stucco requires special plastering skills and knowledge of the right materials to use in the harsh high desert climate. From simple patches to your stucco to a complete makeover to your home or office’s exterior, you can rely on our stucco contractors to provide a quality, long-lasting repair to your stucco. For a FREE estimate on our stucco repair services, contact us today. Octavio’s Painting, LLC, provides residential and commercial power washing services, including graffiti removal and scheduled exterior maintenance. Our Albuquerque painting contractors handle even the toughest restoration and removal projects. New staining to your exterior trim, deck, cabinets and interior woodwork is a wonderful way to enhance the look and feel of your home or office. Our professional painters in Albuquerque, NM have years of experience staining wood and sealing it from the elements. By sealing your wood trim, deck or baseboards, you will enjoy vibrant, beautiful color for years to come. Epoxy floor coatings enhance the appearance of your floors and increase their durability. Whether in your home or your business, you’ll enjoy slip and stain resistant floors that stay beautiful for much longer than floors not treated with epoxy coatings. Want to prevent costly damage to your stucco? Try elastomeric coatings applied by our painting contractors! Elastomeric coatings waterproof the exterior of your home or office, including the stucco and any masonry or concrete. If you’re experiencing water damage or unsightly stucco cracking, elastomeric coating may be right for you. To learn more, contact our painting contractors in Albuquerque, NM today.